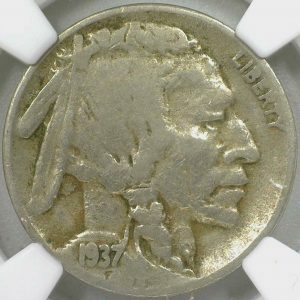 The 1937 D Three Legged Buffalo has been a favorite of collectors for years. Being a rare error type this coin is worth a substantial amount depending on condition and as such is commonly counterfeited. The point of this guide is to help you from getting fooled by counterfeits. The reason some 1937 D Buffalo have three legs is because of a failed attempt to repair the die for making the coins that had been damaged. It wasn’t until some had already slipped out into the public that this issue was found. While the leg is gone, the hoof still remains. 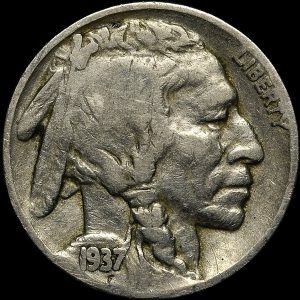 The way people counterfeit this coin is by removing the leg of the Buffalo on a regular 1937 D. Although this seems like a foolproof method, there is a way to identify fakes. First of all, genuine 1937 D three legged buffalo coins have significant die erosion on the back of the Indian’s neck as you can see in this example from our online store. Compare that to this image found on ngccoin.com of a counterfeit and you can really see the difference in the neck. Another telltale sign is any tooling or scratches where the buffalo’s leg should be. Also the “P” in “E PLURIBUS UNUM” is closer to the back of the buffalo on a counterfeit than a genuine three legged. 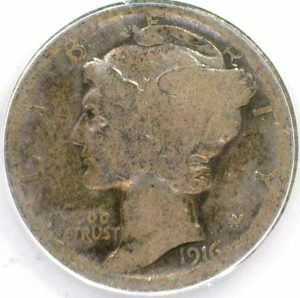 Whether you are a brand new collector or have been a numismatist for years, don’t be fooled by counterfeit coins, we here at Good Ole Tom’s are rooting for you!